Go and enjoy for a limited-time this Pixar-themed event at the Disneyland Resort. See some of your favorite Pixar characters from timeless classics like the Incredibles, Inside Out, Monsters Inc., Toy Story and many more. I had an amazing time! Pixar Fest celebrates the unbreakable bonds at both Disneyland Park and Disney California Adventure Park with a one-of-a-kind celebration. Enjoy this fun-filled Pixar experience and indulge on delicious themed food & beverage options. Grape Soda Cake Pop – Inspired by Disney•Pixar’s film “Up,” this grape-flavored cake pop is dipped in white chocolate and covered in purple sugar. Pixar Ball Cake Pop (Available through June 22) – A vanilla cake pop inspired by everyone’s favorite bouncing ball! Alien Apple (Available through June 22) – Oooooooo, we are eternally grateful for this candy apple dipped in green and blue chocolate and decorated with blue and purple sugar, white and dark chocolate eyes, a mini-marshmallow antenna, marshmallow ears, and a dark chocolate smile. 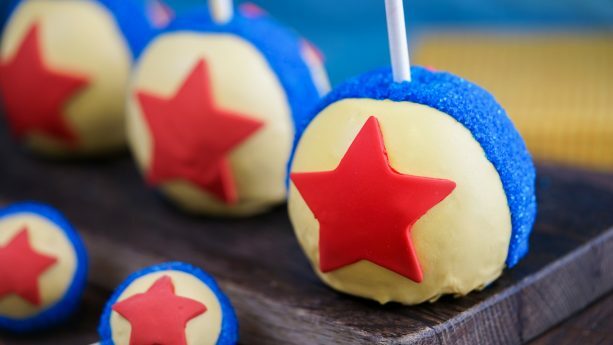 Pixar Ball Apple (Available starting June 23) – Dipped in yellow chocolate, this candy apple is striped with blue chocolate and blue sugar and topped with a fondant star. Alien Cake Pop (Available starting June 23) – This chocolate cake pop is dipped in green and white chocolate and decorated with marshmallows and blue and purple sugar. Baby Dory Cake Pop – You won’t be forgetting this cake pop! It’s a yummy chocolate cake pop dipped in white chocolate and decorated with blue sugar, white and dark chocolate, and sour belts. 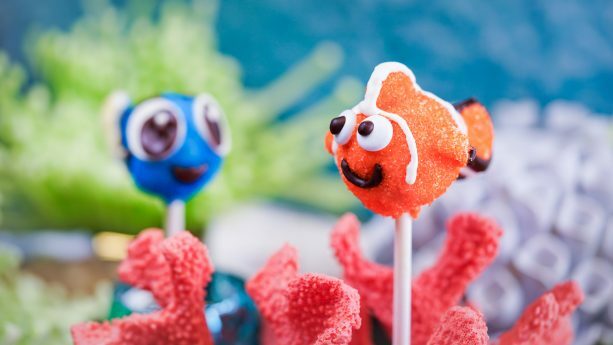 Nemo Cake Pop – No more Mr. Grumpy Gills after eating this chocolate cake pop. It’s dipped in white chocolate and decorated with orange sugar, small round candy-coated chocolates, white and dark chocolate, and sour belts. The Pixar Play Parade was exuberating! It’s at the Disneyland Park for the very first time and I’m glad I got to see it first hand so exciting. First-time appearances include the adorable Pixar lamp, followed by new show elements starring Characters from Up and Inside Out. Together Forever – A Pixar Nighttime Spectacularlit up Disneyland like never before I loved the dazzling pyrotechnics, musical themes from the films, and seeing film clips from some of my favorite movies. The nighttime spectacular takes place in from the castle and is a must-see. Pixar Fest will be in full blast at Disneyland Resort In California April 13 – September 03 , 2018. Don’t miss out! 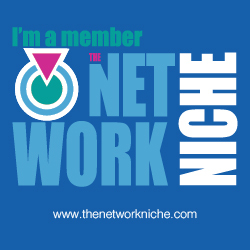 Next week keep an eye out for cast interviews, products guide, and much more.